A resounding sweet success in its first years, Oklahoma’s innovative Jelly Making Trails will undoubtedly stick around awhile. Founded in 2016, the Jelly Making Trails highlight nearly 50 U-pick fruit, vegetable and herb farms on six trails across the state. The program entices Oklahomans to follow their nearest regional trail to harvest blackberries, strawberries, blueberries, peaches and other fresh finds for making jellies and healthy meals. 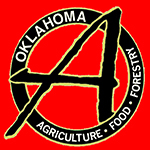 “The response to the Jelly Making Trails is phenomenal,” says Meriruth Cohenour, agritourism coordinator for the Oklahoma Department of Agriculture, Food and Forestry (ODAFF), which created the award- winning marketing campaign. In 2017, the trails won the Marketing in Excellence Award from the North American Agricultural Marketing Officials. Replicating established tourism trails like the Oklahoma Wine Trail or California Cheese Trail, the Jelly Making Trails focus on specialty U-pick crops, such as blackberries, strawberries, blueberries and peaches – well – known Oklahoma fruits that also make great jelly. Agape House Berry Farm, which produces blackberries, strawberries and soon blueberries, southwest of Oklahoma City, joined the Jelly Making Trail the first year. The trail attracted people who didn’t know about their farm, and it gave repeat customers a map to explore more Oklahoma goodness. ODAFF supplied the trail’s farms with maps, jelly jar labels, stickers and field signs to educate pickers. The metal signs give random facts, such as how artists used blueberries to make blue paint in the 1800s or that blackberries contain the highest antioxidant content of any fruit. In 2017, ODAFF’s agritourism division updated the Jelly Making Trails map with additional farms, crop facts, and jelly-making tips and recipes. In 2018, Oklahomans will see more farms and more online resources, such as videos on jelly making. The videos intend to help those intimidated by the jelly-making process or those who simply need a refresher on how Grandma used to make it. With that educational aspect in mind, the Oklahoma Cooperative Extension Service has hosted county bus tours on the trails and ended the day in the kitchen with demonstrations on jelly making. Light gray text is to difficult to read. Septemberfest annually showcases Oklahoma food and fun.